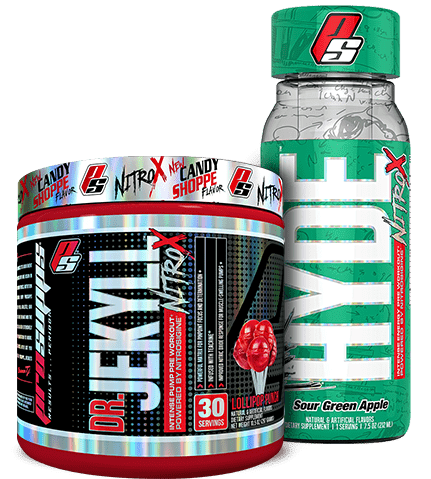 WHAT IS MR. HYDE NITRO X™? Mr. Hyde Nitro X™ is way more than just another pre-workout. Formulated to be the complete training solution, Mr. Hyde Nitro XTM takes training to a whole new level. With ingredients scientifically shown to promote pumps, vascularity, strength, mental focus, sustained energy and motivation. * Mr. Hyde Nitro X™ leaves no stone unturned in the pre-workout checklist. * Don’t settle for just any pre-workout; leave no doubt with Mr. Hyde Nitro X™. Q. What is the main difference with the new Mr. Hyde Nitro X? Q. Mr. Hyde Nitro X should only be taken by men? No, just as many women enjoy the effects of Mr. Hyde Nitro X™ as their male counterpart. Q. If I train in the evening can I take Mr. Hyde Nitro X? It’s not recommended to take Mr. Hyde Nitro X™ within 4 hours of trying to sleep.